Having some sort of quiet time and reading my Bible every single day. Going to the gym to continue to build muscles and get healthy and dramatically lower my sugar intake. Remembering that cultivating my children’s hearts with the gospel is the most important task I’ve been given. My daughter invited Jesus into her heart in September, and we think she will be baptized in January. She got a devotion for children for Christmas, and I am so looking forward to seeing her grow in her faith! I hope as 2016 progresses, I will also see the faith of my two sons increase as well, as little as they are. I went to see my chiropractor today. He asked me how I was feeling, I guess wanting to gauge how things have been and where to start. As I talked to my doctor, I realized the baby steps I’ve made toward healthier living and taking care of my back and myself. I started with physical therapy exercises. In September, I joined the YMCA and have been going faithfully to work on the elliptical or take water aerobics or Zumba classes. And then last week, I decided it was time to tackle diet. I made a fairly drastic change in my diet, but have taken so many baby steps toward healthier eating in the last few years that I know what to do and how to eat for health. I just haven’t always done it. It’s not how most resolutions work, is it? We like to jump in, erase the drawing board, get results as fast as we can get a Big Mac at McDonald’s (which of course we would never do anymore … until January 20 or so rolls around, and we are hungry and tired of salads). 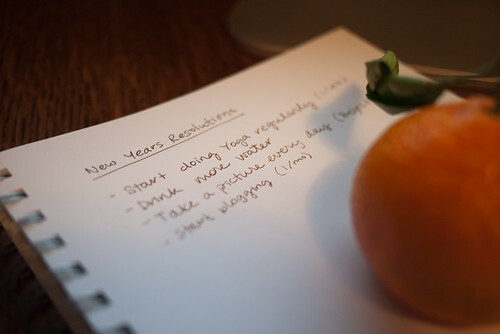 Whatever your resolution this year, may I suggest you take the whole year to establish it? Break it down into 12 baby steps to implement over the year. It may not be as fun or drastic. But I am guessing it will be a whole lot more feasible for you. And yes, parents, this may involve taking time for yourself. I know it’s hard! But we want our kids to see us as people … not just as their mom or dad, who gives them whatever they want and caters to their every demand. Read a chapter of the Bible … exercise for 10 minutes … drink one glass of water. Just do something! And gradually, change will come. 2014 has sprung! Let’s ignore all the blather about how old we’re getting (when did YOU graduate high school?) and instead get to the point. Whether on paper or just in passing thought, you probably make some sort of resolution for yourself each new year. Have quiet time, go to church, lose 20 pounds, stop spending. But why not involve your kids? Sit down together with a pen and paper (or be trendy and use chalk and a big chalkboard-paint wall) and talk through some things you want to do as a family this coming year. Less of a bucket list and more of an goal sheet, this is a great way to hold yourself accountable and get everyone thinking on the same page. Here are some ideas to help you start. Family Traditions – What are some traditions you have or some you’d like to start? Vacationing the same place each year, having a weekly game or movie night, or just having a family devotion before bed? Traditions help keep families together and feeling connected. Places to Go, People to See – This is your “bucket list” stop. What are some places you’d like to visit this year? People you want to see or write to or reestablish a connection with? Think outside the box: could you write to a missionary? Send cookies to someone in the military? Visit a shut-in? Parent-Child Dates – How will parents make sure each child has individual attention? Ask your kids and see how they respond. How do they envision spending one-on-one time with each parent? Weekly Schedule – Talk through how much your weeks hold. Do they seem crammed, with no time to enjoy rest and down time? Would your kids enjoy adding an activity or changing what they participate in? I hope you’ll take these bullets as some jumping-off points. Let me know if you decide on any “family resolutions” for 2014! Tech expert or not, Neat’s Digital Filing System is easy to use. Neat provides users with the unique ability to acquire, organize, access, and activate their information by using one simple platform. Using Neat’s software, information from documents is identified and extracted to create a keyword searchable database. Users can also generate reports, create contact databases, and manage documents quickly and easily. Free up some space in the office by eliminating those paper piles. Archive important information such as medical, insurance, and tax documents in order to access any piece of information directly from your mobile device and easily share through NeatCloud with an accountant or lawyer. Capture information immediately with NeatMobile by scanning receipts or business cards directly into your Neat account and with the help of NeatCloud create expense reports directly from your mobile device. Clear clutter in the glove compartment of your car by scanning automobile information such as: warranties, insurance documents, maintenance receipts, etc. and using NeatMobile, access whatever you need from anytime, anywhere. Clear some space on your fridge by digitizing children’s artwork or report cards in order to make room for more. NeatCloud will allow you to share these precious memories and proud moments with a family member or spouse. Neat has systems for MACs and PCs. Check out Neat.com for more information. Could you use a little digital organization? I know I could! With the New Year here, it is time for me to think about resolutions. The thing is, having children with special needs has changed the way I look at these hopeful declarations of a better me. So I turn to my daughters and see in them examples of who I want to be. 1. I want to love people despite of their appearance. I tend to judge and keep my distance from people based on their exterior. My daughter with Down syndrome has the ability to look past appearances and accept people fully. 2. I want to give it all. Sometimes, I don’t try very hard; I just do enough “to get by.” My daughter with cerebral palsy gives it her all, she is fully in, trying hard, never giving up. Everything she does, she does it to the best of her ability. 3. I want to experience joy in the little things. My daughter with Down syndrome seems to find joy easy. She is not just happy; she is filled with joy (when she is not filled with crabbiness). The way her face lights up with a smile, and the deep laugh that comes from her soul when she is surprised with a bowl of ice cream reminds me I need more joy in my life. 4. I want to celebrate with others. In our home, we celebrate every little accomplishment our girls achieve. Celebration is a normal part of our life; we clap, jump, and cheer often. I want to take that beyond my home, I want to encourage others and celebrate with them. We all need more celebration in our life. 5. I want to make a difference. The world might see my children as less than perfect, but I know that God has a plan and a purpose for their lives. My children have inspired not only me, but many others around them. Hopefully some day, I will be able to do for others what they have done for me. Ellen Stumbo is a writer and speaker. She is the mother of three daughters: Ellie; Nichole, who has Down syndrome; and Nina, who was adopted and also has special needs. She is wife to Andy, a pastor.